This is my child’s favorite activity and I am THRILLED! I have searched high and low for a program that would motivate my child to choose health and exercise; and, now I have found one! Thank you, Cardio Kool Kids! Cardio Kool Kids is one of the most popular and successful classes that we offer, which is a testament to Amy and her commitment to the kids. She is always professional and easy to work with, and she is willing to go out of her way to do extra events anytime we ask her to. I constantly hear rave reviews from parents who don’t know what they would do without Amy and CKK, and the positive role the class plays in their children’s lives. I highly recommend Amy and the Cardio Kool Kids program for other schools. The class is well organized and Amy provides developmentally appropriate instruction for each child. The children have a great time and receive an excellent workout while learning a lot about fitness and health. Amy has wonderful communications skills. Her weekly updates on her class let parents know what the children are learning and why. I continually get positive feedback from parents. Her class size has grown as a result of parents talking to each other about the benefits their child has received from the class. 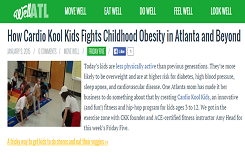 In this day and age when obesity is a rising problem and children are more interested in video games and stagnant activities, we are proud to be able to offer a program like Cardio Kool Kids that will teach our students a lifetime of healthy habits and the importance of physical activity!